The Commission was established in 1931 by Lucky Luciano and Meyer Lansky in Atlantic City of New Jersey. The formation of the Commission did not result in the prevention of all gang wars. However, the scale and frequency of the gang wars did reduce considerably. When one Mafia family declared war on another, the aggressor Family usually found itself at war with the Commission and the rest of the Mafia. This provided a powerful incentive to the Families to negotiate their disputes without bloodshed or wars. To settle wars or internal conflicts, the Commission would sometimes appoint a new Don of the Family and have the usurper or the previous Don assassinated. An ideal example for this is the case of the Bonanno family in the Bonanno War. The Commission is still reported to exist today, though its current membership is only composed of the bosses of the Five Families, the The Chicago Outfit, and the Philadelphia Crime Family leaders. Its activities, like much of the Mafia in general, have receded from public view as a matter of necessity and security after al the recent Mafia crackdowns by the FBI. 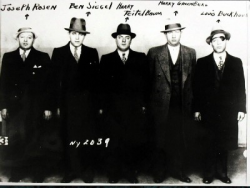 The Commission originally consisted of seven Mafia Family Dons: the leaders of New York's Five Families (Lucky Luciano, Joseph Bonanno, Joe Profaci, Vincent Mangano, and Tommy Gagliano) and the Chicago's Outfit (Al Capone), who represented everything in the Western United States, and Buffalo (Stefano Magaddino). However, after the 1957 Apalachin Convention, it was decided that two more leaders of the families were allowed into the Commission. These turned out to be Angelo "Gentle Don" Bruno of the Philadelphia Crime Family, and Joseph "Joe Z." Zerilli of the Detroit Partnership, although these positions declined much over the 1960s and 1970s. Non-Italian mobsters were also allowed to become members of the syndicate, but the power of voting was strictly limited to Italian members. Lansky was Luciano's chief adviser as well as the Financial Advisor to the Commission. There was no "Boss" of the Commission. However, there was a nominated Chairman. The Commission enforced its beliefs and aims through the notorious Murder, Inc. operation running out from Brooklyn. This service had to be authorized and approved by the Commission through voting first. The number of targets was generally limited to one or a few individuals. This way the Commission avoided a confusing situation which could result in the breaking out of gang wars, and minimized possible press exposure.